This year, Heather and I participated in a retreat where, at one point, we were challenged to consider the struggles, hurts and pains from our past and consider how God has redeemed them. Sounds like a pretty simple proposition framed around a large supposition. Mainly, that God truly does redeem the hard things that happen to us. As it turns out, I worked through the exercise and discovered that most of the heartache and pain I had been through, when looked at through this lens, really had been redeemed. The exercise asked us to list out the ways specifically, which I did, except for one. One. Even after a decade. Still doesn't make sense. I don't get it. I can't see anything good that came out of it. And that was the battle with cancer that a young man in our church in Ancona lost. Massimiliano's death does not make sense. It doesn't fit. Just weeks after that retreat, we found ourselves at dinner with Jim & Cindy Davis, themselves battling her cancer, battling the same questions: Why? How long? What is God doing? I shared honestly with them about the redemption exercise and how I struggled to understand Massi's death and how walking alongside them through Cindy's disease scared me. I didn't want it to happen again. It's a mess. A beautiful, haunting mess. Last week we hosted Angela Foster with Rapha House for lunch in our office. Our staff heard firsthand about what this amazing organization is doing to heal and restore victims of sexual trafficking around the world. At the end of the presentation, at hearing that one of the things they do is teach art to these girls and young ladies, Jim asked if they could use Cindy's supplies. Know this: Jim dreamed of seeing his beautiful Cindy using these tools in a studio of her own. He longed for a day when things would slow down, settle down and she could paint and draw and craft to her heart's content. He knew there were projects unfinished, sketchbooks half filled, images partly formed and shaped. And for whatever reason, God said, "no." And in a blind act of heroic courage, Jim offered these tools and supplies as a humble gift. 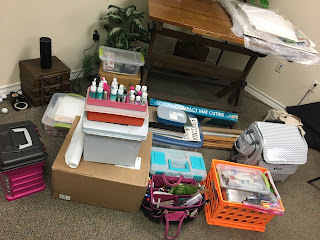 And Angela said she would take as many suitcases as it would take to get these supplies into the hands of these rescued little girls who are being restored. Whose stories are being redeemed. And as much as I don't want it to, it begins to make some sense. Hodell is here to be a positive, transformative presence, to bring light into darkness and to provide the best solution to every window covering project. And I thought, bitterly, that I never got the painting I commissioned. I have this bold, vibrant vision of rescued little girls, holding the very tools that Cindy used to breathe life onto page and canvas, finishing her job. Maybe redemption comes in waves. One day it starts to make sense. The next, it doesn't. Maybe I begin to see it clearly here, but Jim just can't. Not yet. And the waves continue crashing. writing a story of redemption through the tears and on the hearts of his children. Bruises borne on beloved bodies, borne heavy on hearts. Hope is hopeless and ransom a distant dream. Faces fractured, blurred in blood. Smiles spread across scarred lips. For those forgotten and trapped just beyond sight. Huddled and shivering and longing for warm. So they’ll find new life in the arms of the Lord. I'm a fast walker. It's a reflection of the way I'm wired and the way my mind works. I don't like to mess around. I'm a man on a mission. It's difficult for me to enjoy the journey. There is simply too much to do. This summer we visited our eldest son, Jacob, who was serving an internship at a church in Rockford, Illinois. Used to traveling by myself for business, when we landed in Chicago, I began walking toward baggage claim. Three minutes in and I notice I’m by myself. I look back, still walking, and notice that my daughter is just a few steps behind me, but my wife, Heather, is almost out of sight. I impatiently wait for her to catch up before asking her to speed it up. Then I’m off again. Two or three minutes later, I stop and repeat the above encounter. This leads to frustration on my part and anxiety and hurt on her part. I don’t know what she’s thinking. Twenty one years, now, we have been married and this dynamic has played out time and time again and never ended well. How many times will it take? Some of our best friends have been married as long as we have and they have been taking dance lessons for a few weeks and trying unsuccessfully to convince us to join them. It’s comical to hear about how they are doing, but insightful, too. It is causing them to learn to listen to each other, to be perceptive and to trust. The more I reflect on the dynamic in our relationship, the more I see this being left behind as a recurring symptom of what causes disruption in our oneness. If I am not slowing down, can I hear her? If I am not adjusting my pace, will I know her? If I blindly and doggedly rush to where I’m going, will I be alone? Will anyone be following? How many other areas of my life is this dynamic playing out in? At work? With friends? With my children? At church? With God? So I have to remind myself to lead by slowing down and matching our rhythms. To stroll. To listen and engage. We will get to where we are going, it may just take a little longer. But together is better. No one wants to get left behind, and I’m tried of getting left ahead. The flip-side: are you following someone like this, or trying to? What are some good, gentle ways you have learned to get the other’s attention? What are ways you have discovered to close the gap? I will write a new song to the Lord, for he is worthy of praise! His ways are high above the ways of men. They are glorious to behold. They bring me to my knees. I am not worthy to be included, so great are his thoughts and plans. His beautiful mind knows all. His glorious eyes search out a man's spirit and He brings all things together for good. Like a weaver he pulls threads together, he pulls blues and golds and bright crimson together in the loom to make a heart-stopping beauty of a creation, a tapestry awe-inspiring to behold. Lord, your thoughts are so far beyond mine, who am I that you would reveal them to your child? It can only be by your holy spirit that courses within me, seeking to break down the old, the rusty and crusty, the torn and worn, the tarnished and barnacled, working to make all ways within me new, and vibrant, pulsing to the rhythm of the Father's heart. It is only by the Spirit's power and ability that my dull senses are made alive and like a faint candle in a forest do I see his movement, and squint my eyes to see, to seek out its path and stumble slowly after it. It is only by his glorious quickening of my spirit and eyes that I can see and follow. I long to catch up, to where I can bask in the Spirit's presence, to let his light pool around me, to make fear dissipate altogether, to feel the warmth and safety of his presence. What a glorious path we tread together, even at night, though all around me is dark, though forms both ominous and treacherous encroach us, ever does my gaze roam, flitting back and forth from the Spirit's light to the moon that slips from treetop to treetop. What a glorious path. I would take no other. For it is along this one that my heart is tested and made strong. It is along this one that I knew the strength that you have infused me with. It is along this one that I find rest and refreshing. From time to time our path runs parallel to the other, the way of the weary. Like lifeless zombies it seems, they plod along, sick and decaying, neon light in their dead eyes, they have given up hope, taken a false name, traded a hurt heart for a chain. Low and coarse is their chant, their moan. It can be heard from over the sound of the wind as sorrow fills their lungs. They are blind and do not care. They are deaf and do not miss their hearing. They bump into one another with vicious violence, not caring, tearing paper-thin skin, chuckling melancholy, choking on tears. Oh Lord, I do not want to gaze upon that path. I praise you for opening my eyes to its plight for I once tread upon its thorny trail. Praise be to you for freeing my spirit from its painful plodding. And as you lead me along, away from its horror, your heart yet hurts for these weary souls, for they, too, are sons and daughters, thought they know it not. They, in calloused hands, hold tattered and frayed ends of puppet strings, pulling themselves along, believing to be controlled by others, when all along, it is they that lead themselves. Oh Lord, your ways are so good and I exult in your marvelous creation. Be not far from me. May I ever see your light and the path before me. Teach me your ways. May wisdom be my constant companion. Whisper to me by night and may I hear your roar in the morning and your laughter at noontime. Fill these woods with your Song and lead me onward to places of delight. Oh, that all may know this great joy. This blog follows the life, ministry and adventures of the Casey family. We were missionaries in Ancona, Italy from 2000 until 2011. We are now adventuring in the US of A, experimenting with running a business, growing a garden, raising a family and challenging the Church to break outside the box and adopt new forms to reach a new generation with the truth of the Gospel. Born in Santiago, Chile I have grown up on the move - lived in some 15 different homes. I am a 'word' person - enjoying almost anything to do with books and literature. I love exploring God's great world and helping people find their place in it. If we were to raise her out of the water, if we were to restore her completely to what she was originally intended to be...what would she look like? If we were to remove her from all the traditions that humankind has surrounded her with and drowned her in...who would she be?